Experience the fun, excitement and beauty that is Seattle. Follow our experienced guides as they weave through the rich history of Pioneer Square and the Gateway to Alaska on thrilling, futuristic Segways. Experience the front line of modern art and transportation as we pass the Sculpture Park and explore the City Center from Space Needle to the musical International Fountain. Enjoy lush parks and blossoming flowers as we taste and smell our way through Pike Place Market, before we glide through the rich architecture and soaring cityscapes of Downtown and the International District. We begin at our office at 55 Spring Street where we will get you fitted with a sanitized helmet and a good training on how to safely ride a segway. From there, we go along the waterfront where you have ample time to get comfortable with your new machine as we make our way to Pioneer Square & the Gateway to Alaska. From there, we go past Olympic Sculpture Park as we head into the city center towards the Space Needle and the musical International Fountain. Next stop is the famous Pike Place Market as we then head beck down to our office where we will laugh, recall your trip and depart. 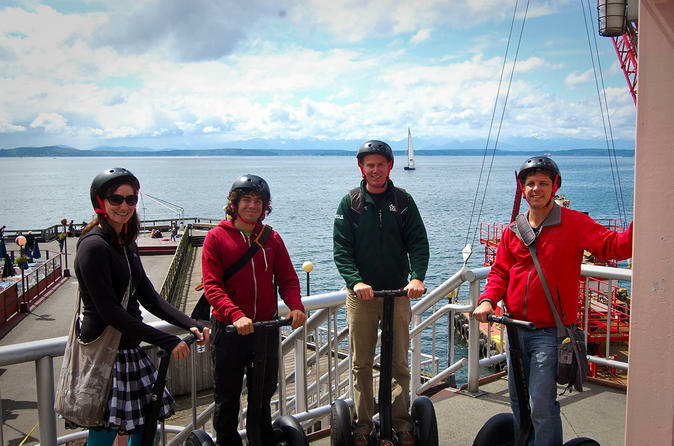 Come see Seattle the best way, on a Segway!